Treasurer Josh Frydenberg has delivered a ‘back in the black’ Budget aimed squarely at voters, stressing the Morrison Government’s commitment to financial discipline and low taxes. As expected, the Treasurer signaled sweeping tax cuts and major infrastructure spending if the Coalition wins the upcoming federal election widely expected to be held in May. This largesse is made possible as the Budget heads towards surplus for the first time in 12 years. Extra revenue has flowed into the Government’s coffers from a surge in company tax on the back of higher commodity prices, and a higher personal tax take as more Australians find work. The Federal Budget is all but balanced. 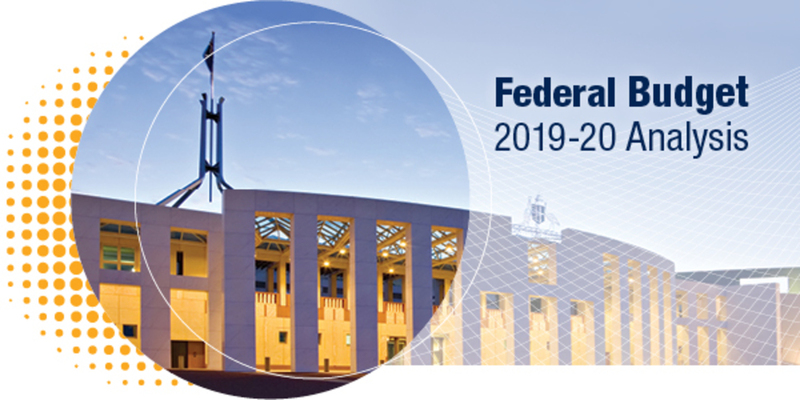 The Government expects a small underlying Budget deficit of $4.2 billion this financial year, unchanged since the mid-year Budget update in December, before moving to a $7.1 billion surplus in 2019-20. The Budget’s big spending promises come despite a worsening economic outlook over the past six months. The Treasurer forecast growth of 2.25 per cent this year rising to 2.75 per cent in 2019-20 and 2020-21, slightly lower than the 3 per cent forecast in the mid-year update. The centerpiece of the Budget is an extension of the already announced multi-year tax package. Low and middle-income workers will receive immediate income tax relief of up to $1080 for single income families and up to $2160 for dual income families from 2018-19. By 2024-25, 94 per cent of taxpayers on incomes below $200,000 will pay no more than 30c tax in the dollar. Incomes above $200,000 will pay 45c in the dollar. The Low and Middle Income Tax Offset (LMITO) will almost double from $530 to a maximum of $1080 a year for people earning between $48,000 and $90,000, to be received after people submit their 2018-19 tax return. People on income below $37,000 will receive an offset of up to $255. In the wake of the Banking Royal Commission, financial regulators Australian Securities and Investments Commission (ASIC) and Australian Prudential Regulation Authority (APRA) will be given a boost of more than $550 million to clamp down on misconduct. The Australian Taxation Office will be given extra funds to crack down on welfare cheats and tax dodging. The Government has pledged $527.9 million for a Royal Commission into the abuse of people with disabilities. It has also recommitted to fully funding the National Disability Insurance Scheme, but a slow take-up of the NDIS has delivered a $1.6 billion saving to the Budget’s bottom line and contributed to the projected Budget surplus. The creation of a new $337.2 million drug strategy to address harmful opioid use, improve family support services and increase capacity of drug and alcohol services in remote and regional areas. The same group will also be allowed to make three years’ voluntary non-concessional (after tax) contributions, currently capped at $100,000 a year, in one year. The focus instead is on a new $525.3 million skills package to provide vocational education and training that will fund 80,000 new apprenticeships and double incentives to employers to $8000 per placement. This is an unusual Budget as there will be little chance of legislating most of the spending measures before a federal election in May. Monetary support could come from the Reserve Bank which announced yesterday the official cash rate will remain on hold at a record low of 1.5 per cent while also signaling it is prepared to cut rates this year to support growth if needed. Labor has flagged it will deliver its own economic statement later this year if elected. We will have to wait until after the election to see whose policies will take Australia forwards.